Show your team pride with this Authentic Mitchell & Ness jersey circa 1990. Mitchell & Ness specializes in producing historically accurate vintage football jerseys. 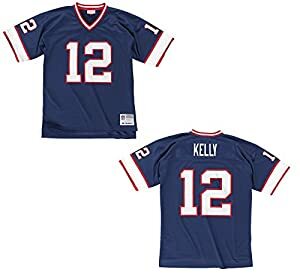 This Jim Kelly jersey is an authentic replica of the one he wore during the 1990 NFL season. It features twill team name on front and twill number on the back. -Small - 19.5" / 29"
-Medium - 21" / 30"
-Large - 23" / 30.5"
-XL - 25.5" / 31.5"
-2X - 27.5" / 32.5"